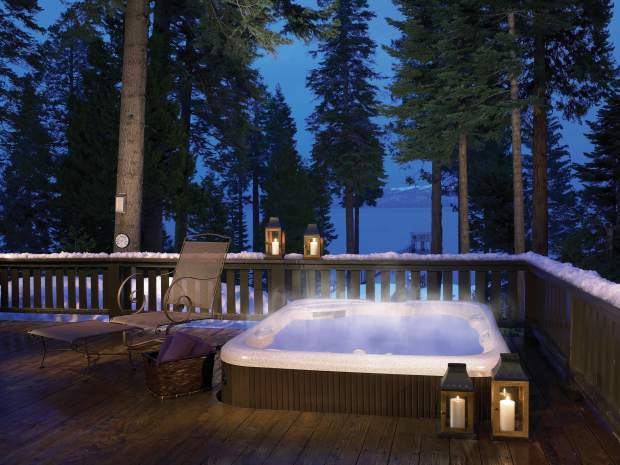 A hot tub can provide the perfect escape after a long day on the Tahoe ski slopes. While most hot tub owners love their spas, they’ll be quick to tell you that owning one is a commitment. Like a car, boat or furry companion, hot tubs require ongoing cleaning and maintenance to function properly, and there is a host of additional expenses to consider beyond the initial cost of the spa. But despite the effort, it can all be worth it to soak in deliciously hot water, drink in-hand as troubles and body aches fade away. Reported health benefits of hot tubs include improved blood flow, better sleep, stress release and relief from back and join pain. Others use their spas to spend quality time with family or to improve the value of their rental home. But how to know which spa is right for you? For that we consulted the local experts. 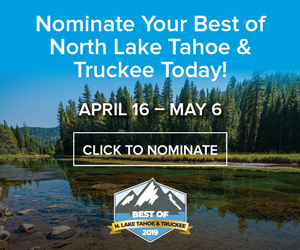 Mountain Home Center owner Tom Just has been matching Truckee/Tahoe homeowners with the hot tubs of their dreams for more than 30 years. 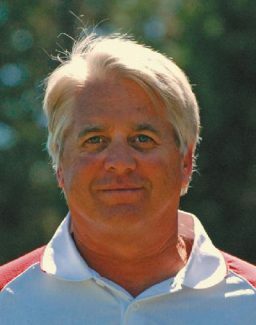 He will tell you to avoid imitation stone siding on your hot tub (it doesn’t hold up well), and he’ll cheerfully talk you out of purchasing an LED television screen or stereo for your spa (water and electronics don’t mix well, and you shouldn’t stay in for very long anyway). His satisfaction stems from selling homeowners quality, reliable hot tubs that will hold up for years to come. Just cautions there is a lot to consider when buying a spa — the two first questions being size and budget. To gauge size, homeowners should consider who will regularly use the hot tub: a couple? Family? Multiple families? If the hot tub will be placed on a deck, available deck space should also be taken into account. Budget is the second major factor in determining which spa is right for you — keeping in mind maintenance and operating costs as well as the tub’s sticker price. A chain warehouse spa starting at $4,000 could cost up to $150 per month to operate, while a $7,000 spa may cost as little as $15 per month, making it possible to make up the price difference in energy savings in less than two years. Warranties, which can range from one to seven or more years depending on the manufacturer and model, speak to the quality of the spa and can save owners considerable cash down the road should something go wrong. “There’s a lot that goes into what it costs to own a tub beyond the initial investment,” says Just, noting that most costs are fixed whether you buy a cheap spa or invest in a high-quality one. Hiring electricians to wire the spa, for instance, costs the same regardless of the model, as do crane fees to get the spa onto a raised deck. These additional costs become a factor again if a broken spa needs to be replaced without warranty. All to say, it’s better to do it right the first time. It is critical to consider where the spa is going to live prior to making the purchase. If the hot tub is going to sit on a deck, it’s best to confirm with a structural engineer that the deck can sustain the added weight. An average four-person hot tub weighs around 5,000 pounds when full. 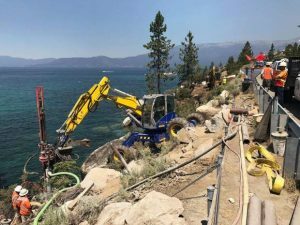 Homeowners will also need to factor in the cost of a crane to lift the spa onto the deck, which runs about $500 to $1,000, according to Tim Crowell, owner of Tahoe City’s Lake Level Crane Service. If the spa is going to be placed on the ground, it should sit on a flat, concrete slab. This ensures the hot tub remains stable as the ground beneath it freezes and thaws with the seasons, as well as helps to keep out any sand, which can cause serious damage to the spa. Mountain Home Center is proud to sell Hot Springs spas made by Watkins Wellness, the world’s leading manufacturer of hot tubs. 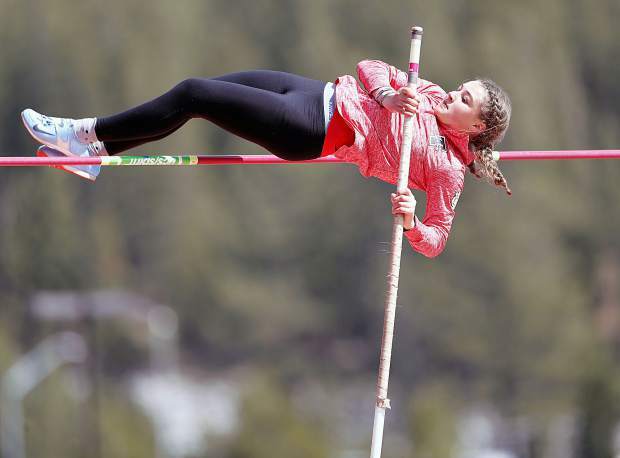 While vendors will tout the benefits of their own spa manufacturer, the warranty plans and low energy use statistics for Hot Springs’ upper echelon of spas are solid. Even so, Mountain Home Centers’ greatest advantage may not be the quality spas they sell, but their maintenance and service contacts that are available exclusively to their customers. Hot tub dealers are the ones responsible for a spa’s warranty, making it critical to purchase a spa from an easily accessible, reputable dealer. While self-contained hot tubs are the most popular choice, homeowners can also opt for custom in-ground spas. While considerably more expensive to install and operate, in-ground spas offer a sophisticated aesthetic that self-contained units can lack. Based in Reno, Robert Allen Pools and Spas has built custom in-ground spas for clients in Martis Camp, Lahontan and around Lake Tahoe. Ranging from the upper $20,000s to $50,000 (compared to $15,000 for a top-of-the-line, self-contained unit) and operating costs can run up to $200-$400 per month in winter. Given the high cost of operating and repairing in-ground spas, Tom Just has seen a number of homeowners rip out their in-ground spas and replace them with a self-contained units; however, it’s hard to compete with the beauty of a custom, in-ground spa, especially now that in-ground jet massage systems have improved over the past 10-15 years. Homeowners can also consider stainless steel and copper above-ground spas, which tout durability, bacteria resistance and a sleek, modern aesthetic. “Custom, above ground spas are another great option for those looking for a luxury look,” said Justine Macfee of Truckee’s Catherine Macfee Interior Design, who has worked on custom spa projects in Lake Tahoe and beyond. Whichever the right spa is ultimately the right choice, it’s safe to say it will be calling your name after a day on the slopes or stressful day at work. And as stars shine bright in the cold, winter sky, you’ll be gazing from a swirling pool of soothing heat.